Scott Tyler is a Shifter, a teenager born with the ability to undo choices and alter reality. Scott’s been through hell, struggling to control and accept his abilities while fighting off the organizations who want to use Shifters as weapons. After all, a trained soldier is dangerous. A trained soldier who can keep repeating battles until they find a way to win is terrifying. Kim Curran is one of the best voices in YA. Glaze, her social network driven SF novel, was a highlight of last year and it’s a pleasure to see her get a chance to finish her original trilogy here. It’s also interesting reading this after Glaze, as it gives you an idea of just how versatile she is. The nature of Shifting means that the books are inevitably a little cross genre and Curran revels in that here. 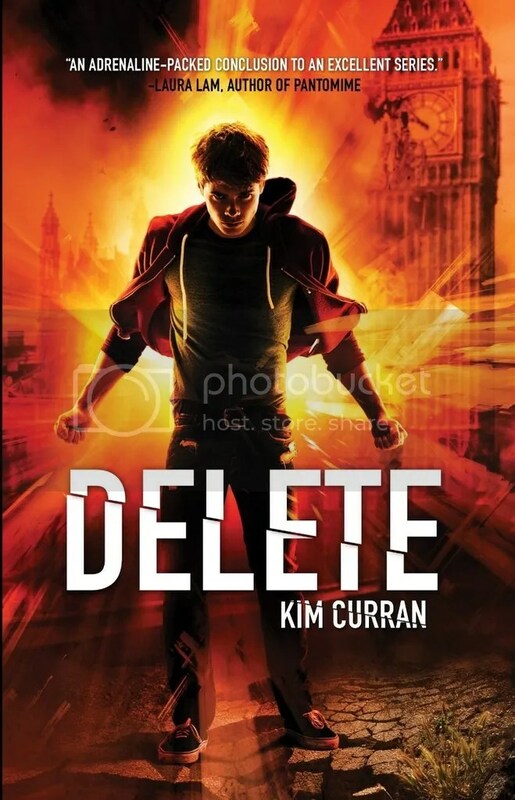 Where previous entries have been nearer the superpowers/conspiracy end of the spectrum, Delete is a flat out action movie and one that gives Curran a chance to show just how good she is at writing pacey, intelligent action. Highlights include some terrifying uses for Shifting mid-firefight, a hostage extraction that goes south and a closing, epic scale battle that includes an armoured vehicle, a helicopter and some creative battlefield engineering. In every case, Curran never loses sight of the characters, the human cost of the war or the motivations on each side. It reminded me of the moral complexity at the heart of The Tripods series and there’s the same sense of weight and responsibility to every choice made here. One particular scene, in which a single shot is fired, really drives that home. This is a book where every choice matters and the alternatives aren’t always good ones. That responsibility really comes to the fore in the book’s most interesting subplot. Scott, marooned in the life of a tougher, nastier version of himself, begins to hear that version as a separate voice in his head. There’s a ticking clock throughout the book as Scott struggles to keep his own identity, even as he begins to settle into the training and memories of this version of his life. A lesser writer would have wrung cheap drama out of this but Curran does something far more interesting. The voice in Scott’s head is a Special Forces Jiminy Cricket, a constant reminder of the weight his choices carry. Plus, as the book goes on and we find out more about him, Curran pulls off something extraordinary. The Scott in this universe clearly had as complex and incident heavy a life as the Scott we know. He’s made tough choices, often bad ones, but he’s also clearly working to control his fate. The impression you’re left with is something close to the best, most action-packed episode of Quantum Leap never filmed. Scott doesn’t arrive at the start of his story but rather in the middle of his counterpart’s and must not only survive but try and honour both their agendas. That level of complexity and nuance is shot through the entire book. Scott’s relationship with his younger sister is difficult, sweet and real while his interactions with this reality’s version of some of the series’ previous villains are highlights of the book. In this reality, one of them is a hero and the other a victim and their fates, both versions, are yet another millstone around poor Scott’s neck. Most interesting of all though are this reality’s version of Aubrey and Zac. Aubrey is recast as a fellow soldier, one with a code of conduct more rigid than Scott’s and who is initially set up as a rival to him. Seeing Scott, both of him, struggle with their feelings for her provides the book with some of its best moments and Aubrey is always Scott’s equal at the very least. Curran’s heroines have always been a standout feature of her work and that’s true here. Aubrey never feels like a supporting role, rather the lead in her own story that happens to cross over with Scott’s. Likewise Zac, who steals nearly every scene he’s in, feels like a lead in his own right. Handsome, charming and with far more going on under the surface than you might think, he, Aubrey and Scott are the foundation for a rock solid, highly intelligent, exciting story. 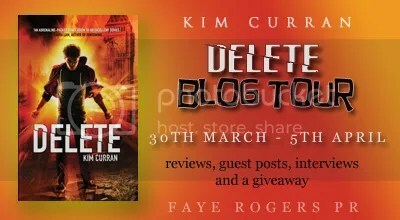 Delete is a perfect capstone for Curran’s trilogy, embodying and exploring every aspect of Shifters’ terrifying abilities. It’s also a perfect example of just how good Curran is. Whether writing colossal action scenes, small character moments or new twists of the reality shifting knife, she’s at the top of her game here. So stack the odds in your favour, and pick up Delete and its predecessors now. As part of the blog tour, we’re running a Rafflecopter giveaway where the prize is all three books. Click below to enter.